Student Ideal Organic Energy Bars (and a Giveaway)! This post is dedicated to the students of BMCC: Borough of Manhattan Community College. I remember when I was a student, especially during the mid terms when I was pilled up with exams, I was craving for sugar and the easiest snack I could find back then, was a chocolate or ready made cookies. Nowadays I crave for a sweet bite regularly, most of the times because I feel tired or stressed, but I try to control it with healthier choices. An article that was written by my dietitian, Ioannis Kerimis, “Stress and Emotional Eating”, made me realize that most of the times the reason I end up eating sweets is mostly because of what I feel. I tried to create a snack that can give the receiver a sweet taste, without the guilt that usually accompanies similar snacks, and at the same time to offer energy and nutrition, something that it is essential for students. In this way we can satisfy our need for a sweet bite and control our weight too. Another article that gave me useful information about my eating mistakes is “Factors that negatively affect weight loss”. These bars are made with organic ingredients and they contain approximately 125-130 calories per bar. They are very easy to make and they can be stored in the refrigerator for up to two months. As a Thank you gesture I wanted to make a Giveaway of a purely Mediterranean Cookbook. My dearest friend Ivy from Kopiaste.org was kind enough to offer us the 1st Volume of her excellent e-Book “MINT, CINNAMON &BLOSSOM WATER”. Volume 1 includes all Savory dishes, mezedes, side dishes and salads. Ivy also wrote a 2nd Volume of "MINT, CINNAMON & BLOSSOM WATER”, which you can find at: https://www.smashwords.com/books/view/100265. In Volume 2, you will find Breads, bread products, Pites (pies), snacks, almyra (savory pastries), traditional and modern Desserts, Glyka tou koutaliou (fruit preserves), marmelades (jams), drinks, etc. The winner of the Giveaway will be announced at the 29th of February 2012 after a random draw. (Random.org will be used). Due to a blog problem leaving a comment might take 3-4 minutes, but finally it works. - Share the post in Facebook and/or Twitter and Copy/Paste the link to my blog letting me know that you've done so. - Leave a 2nd comment on this post stating your thoughts about emotional eating. - You can leave up to two comments. 1) Place all ingredients except egg-whites, honey and apple in a food processor and pulse until the mixture is finely chopped. 2) Add the egg-whites, honey and apple and pulse until the mixture is well combined. 3) On the bottom of a square pan (25cm x 25cm) place a non stick baking paper, and spread mixture evenly in the pan. 4) Bake in a pre-heated oven at 170ºC (350ºF), for approximately 20 minutes. 5) Allow to cool and cut into 20 bars. 6) Wrap with clean film and store in the fridge. Although they are very good for you and would be a good snack I have noticed that people tend to shy away from "healthy" food thats obviously healthy, I dont know why but I think food is a channel for more complicated issues and sometimes I think people dont want to "settle" because food is one of the only rewards they can award to themselves so for some reason (probably sugar..lol)I noticed people "women especially" have a love/hate relationship with food. The organic bars look like they are full of health!Lovely idea of making these bars and its amazing that you thought of something that is so quick to make:)Have a great week ahead! I do welcome a healthy snack and there is just enough sweet here to help you get through the craving. Glad to come across this recipe. Dear Efty, even though I have a subscription to your posts, I come here quite often and really miss you when you are not here for a while... Thank you for your post, it is a great and healthy snack. My emotional eating is all about tomatoes with piece of feta cheese and rye bread, and I can eat a lot of it when I am stressed. What can I say, I am crazy about tomatoes! I believe this is the first time I've seen a recipe for energy bars. In this economy, this recipe is a gift. I'm stocking up on my next trip to Costco and will try my hand with this recipe. I spend a fortune on energy bars! These are perfect morning or afternoon snacks to stop your crave for something sweet. Good luck to all your readers for my cookbook. These look great. We often eat granola or energy bars after a workout. I'm going to try these instead. Thanks! These look delish! You have a wonderful site and congratulations on the blog award from Sudha! It was a wonderful pick! I too struggle with craving sugar when I feel stressed but have been trying to hit the treadmill instead! I look forward to reading your blog! Have a wonderful week! 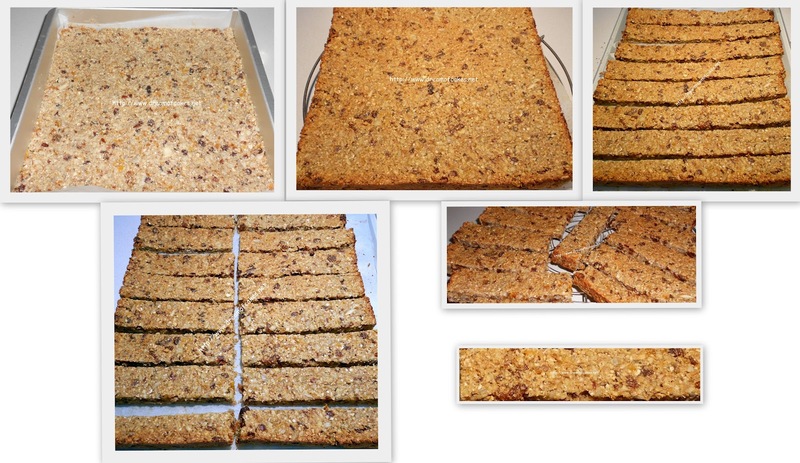 Energy bars looks yummy and easy to make. Wow, healthy & delicious bars! Sounds wonderful! Many thanks for your kind words! I'm currently a student at Towson University and could totally use some of these bars to boost my energy while I'm writing my research paper. They sound delicious. Thanks. Beautiful valentine's day treat!Love the decoration and congrats on the Award! I am a BMCC student. I like the recipe and I can wonder why we crave for sweet things when we study because at times it's so boring and miserable. These bars look great! A great snack indeed! Ευτυχία φαίνονται τέλειες, θα τις δοκιμάσω σίγουρα! I am a BMCC student and these snack can be really helpful. Many of us likes to eat while studying or doing any homework; this looks like a delicious snack and its healthy. These bars look healthy. The ingredients are very important to me and I hope to make these soon. Hey - these look great! I've just seen this post, I don't know how I missed. Anyway these bars are good for me as I usually forget to eat until late afternoon. These look just like store bought granola bars- except much healthier, no sucralose or fructose syrup involved here! Love the addition of apple and almonds. I'll definitely be trying these out and let you know if I make 'em on my blog. Healthy looking energy bars. Thank you for dedicating this to us-the BMCC students! P.S. These energy bars also seem to truly provide fast-acting carbohydrates to facilitate quick energy delivery. They also have a generous glycemic content that can help our bodies to be fuelled anytime we need. A perfect healthy energy bar recipe. I love energy bars but fear all the junk in them--love that you've made your own! this is so true and energy bars are not even that bad. they are the perfect snacks with less calories and can definally hepl with coping with the stress of midterms. This snack bar looks really good, i wasn't a big fan of snack bars but i'd love to try this one. This is Hager! hey I'm Bmcc student,this is a good snack to munch on espcially when your stressed out and want something sweet. Super helpful while studying for an exam. I'm a BMCC student and these snacks have lots of ingredients to that can you energized and focused while working/studying. They must be quite dense too and the sweetness can bring you back for more bites! I'm not an emotional eater, but I see how using food can ease the stresses of everyday life because it is something we ourselves can control, especially when we feel the world around is totally out of our control. It is probably better to have a snack like this than to reach for the chips/candy/etc. Keep up the great work!! ~Michelle M.
As a student in psychology class, I can tell you this is highly needed for me. Not only do I have to balance out high school work but also credits for college. It becomes a tedious task and I need that little energy boost which this bar gives me. Maybe it's the fact that I'm eating something so sweet and delicious that brings my spirits up again (making it all mental) or if it really does work. Either way I really enjoy this recipe! Thank you! Thank you for this recipe. I am very aware of my eating habits and my stuggles with weight. Thought I am usually within a healthy weight for my size, I realize that the slippery slope to weight gain will sneak up in a moments notice. In truth, maintaining a heathy weight and fit body is simple, move more and eat wisely. That said, as obvious as it is, there have been so many times that I slide right out of my good habits into the abyss of inactivity and unheathy eating. Stress, bordom, and sometimes even social gatherings will throw me out of my healthy habits. Perhaps staying in tune to a blog such as this will be a reminder as the great benifits of healthy living. Developmental Psych speaks a great deal about support systems in life. Perhaps this is another outlet. This recipe looks phenomenal considering that finals are nearing into close intervals. Subsequently, I have been looking for healthier substitutes to stay energized for studying and work purposes. Although I like to think that I make healthy choices when it comes to food, I find myself pivoting down this inexplicable road of extreme junk food when I am under a lot of stress especially when it comes to academia. Though I am able to compensate this shortfall with consistent workout routines, I have seen the negative effects that it holds over me physically and mentally. Although easily attainable snacks such as snickers, Hershey bars, or M&Ms give me a 5 minute boost of energy, I will innately feel myself worse off than I was before. When eating these types of snacks, I become very irritable and unfocused in which I care not to fully give 100% whether it be in school, work or my family life. Recipes such as yours are a great alternative that every individual with a hectic lifestyle should consider opting to for a richer and healthier lifestyle. Recognizing the impact of sweets on focus makes me think about the food served in schools. If they are highly processed carbs, does that contribute to students' lack of motivation in the classroom. Also, exercise is so important for maintaining the health of nervous system processing, reduce stress, enhance mood, and support feelings of well-being. So exercise in schools can also nurture student well-being in the classroom enhancing their ability to apply themselves to tasks at hand. The placebo effect has sometimes been defined as a physiological effect caused by the placebo, as a placebo is an inert substance that does not directly cause anything. Even if that bar does not give energy students are still thinking different. They believe at that so that brings them energy. I actually went to the doctor on Tuesday and she said I should stop eating unhealthy food because it can cause some serious heart problems so she advised me to start eating foods with vegetable, fiber and grains. Your recipe will be a great start for me and I am really exicited and mostly during these finals week, stress increased so at least I have something to chew on..